Ronnie Shade is one of Great Britain & Ireland’s best amateur golfers of all-time and probably Scotland’s very best. Indeed for a while in the mid-1960’s he was considered the best amateur in the world. Ronald David Bell Mitchell Shade MBE was born on 15th October 1938 in Edinburgh. He grew up playing golf at Duddingston Golf Club on the east side of the city where is father John was the club pro. He attended the nearby Portobello Secondary School. Coached exclusively by his father he developed a somewhat mechanical swing but one that he could repeat and rely upon. He was known for keeping his head down well through impact. “Before each shot, Ronnie goes through a series of seemingly odd contortions. These are his father’s idea. He believes that the muscles have to be ‘reminded’ of their role before each shot. Young Shade can be observed standing away from the ball posing in the top of the backswing position and flicking his hips. This is to ‘remind’ his hips to move first. His most unusual pose is the follow through which he performs and holds three three times before each stroke” – World Sports Magazine, 1962. He quickly showed promise on the links winning the Edinburgh Boy’s Championship in 1954-55-56. He represented Scotland in the Boys’ International Match in 1954-55-56, captaining the side in his final year. He took his junior victories onto the national stage in 1954 firstly winning the British Youth’s Under 18 Open Championship by 3-shots at Dumfries and County GC. In 1956 he secured the Scottish Boys’ Amateur Championship beating AJ Hanley at North Berwick 7&6 in the final. His best finish in the Boys’ Amateur Championship came in 1956 when he reached the semi-finals before losing 4&3 to CW Cole. He was first selected for Scotland’s Men’s team in 1957, playing one match in The Amateur Internationals (now the Home internationals) against Ireland. He played in the Internationals in 1960-61-62-63-64-65-66-67-68 competing against all the home nations. 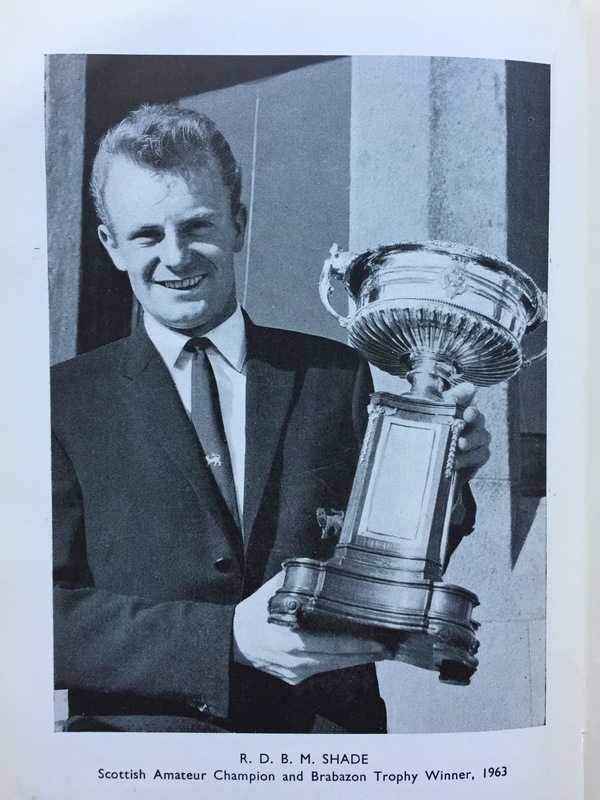 He is best known north of the border for winning five consecutive Scottish Amateur Championships between 1963-1967. 1963 – beat N Henderson 4&2 at Troon. 1964 – beat J McBeath 8&7 at Nairn. 1965 – beat GB Cosh 4&2 St. Andrews. 1966 – beat CJL Strachan 9&8 at Western Gailes. 1967 – beat AB Murphy 5&4 at Carnoustie. When he lost in the fourth round of the 1968 Championship it brought to an end a staggering run of 43 successive match wins, 35 of them coming over 18 holes. His record could have been even better too as he also lost the 1962 final to SWT Murray 2&1 at Muirfield. In 1968 Shade won the second Scottish Open Amateur Stroke Play Championship, held at Prestwick, with a 282 total score. 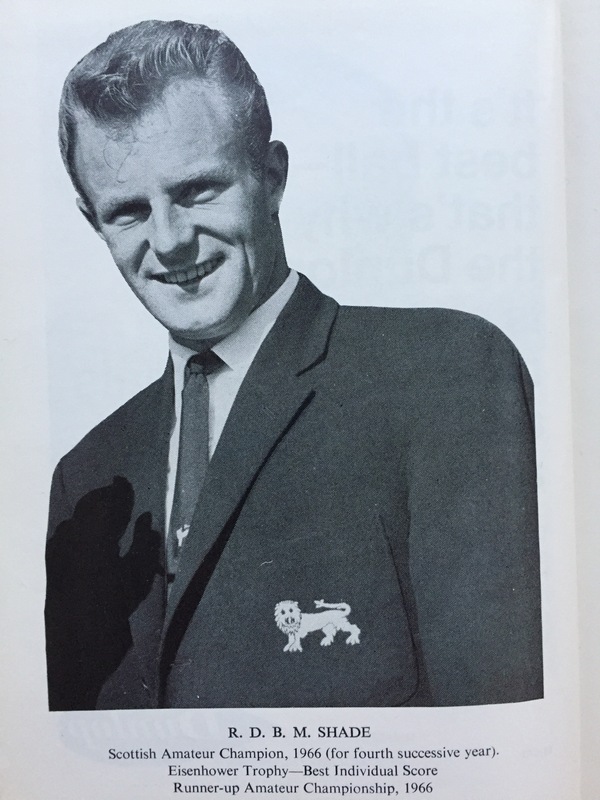 He won the the English Amateur Open Strokeplay Championship (for the Brabazon Trophy) three times, in 1961-63-67. In 1966 he lost the final of The Amateur Championship to South African Bobby Cole. Shade played in 8 Amateur’s between 1961 and 1968 winning 26 of his 34 games Whilst his 76.5% win percentage is nothing to be ashamed of Shade must have been disappointed that he couldn’t have performed better in our most prestigious event. 1968 Troon – 6th rd loss to RL Glading 1 hole. He represented Great Britain and Ireland (GB&I) four times in the Walker Cup, playing in 1961-63-65-67. Ronnie Shade played 14 games winning 6, losing 6 and halving 2. In this era this represents a very creditable record. Shade was selected for the 1962-64-66-68 GB&I teams for the Eisenhower Trophy. During the 1962 event he set a new course record at Kawana in Japan (66), in 1964 GB&I won the Trophy in Mexico (Shade played with Michael Bonallack, Rodney Foster and Michael Lunt) and in 1966 he was the leading individual player (283) with GB&I coming second (this time with Peter Oosterhuis and Gordon Cosh joining up with him and Bonallack). In 1966 he won the Silver Medal for the low amateur at The Open Championship, finishing tied 16th. His only major championship appearances came in The Open which he played 14 times during his career. The third Carling World Championship was held at Birkdale in 1966. Shade won the low amateur honours at this mixed pro and amateur event. In recognition of his outstanding 1966 he was awarded The Association of Golf Writers Trophy. Ronnie was often referred to by his fellow players as “Right Down the Bloody Middle” – based on his initials – due to his consistent driving, which formed the bedrock of his play. “No one I have ever seen, even to this day, hit the ball as straight as Ronnie did. He was an extraordinary player.” – Bernard Gallacher, The Scotsman, 2009. 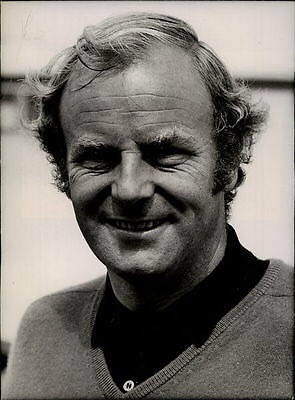 He was awarded an MBE in 1967 for services to golf whilst he was still an amateur and aged just 28. Ronnie turned pro in late 1968 aged 30 and whilst he didn’t quite make it the move was not without some success. He won both the 1969 Carroll’s International and Ben Sayers Tournament in his rookie season. A smooth transition was not unexpected as Shade had a reputation for meticulous preparation in the amateur game which no doubt stood him in good stead. He finished 20th in the 1969 PGA Order of merit with prize money of £2,689. Fellow Lothians man Bernard Gallacher won the Order that year with £6,793. He got to 14th in the rankings in 1970 and finished in the top 60 every year until the mid-1970’s. His only other pro wins came at the Scottish Professional Championship (1970) and Mufulira Open in Zambia (1975). He represented Scotland at the World Cup three times, in 1970-71-72, and in the Double Diamond Internationals five times, in 1971-72-73-74-75. Shade remained a strong match play exponent in the pro ranks, finishing runner-up at the British PGA Matchplay Championship in 1970 as well as reaching the semi-finals on two other occasions. In 2005 in a Sunday Herald article by Golf Correspondent Nick Rodger Ronnie Shade was ranked 17th in a list of the Greatest Scottish Golfers. After a long battle with cancer Ronnie Shade sadly died on 10th September 1986, just over 30 years ago, aged only 47. By this time he had been reinstated as an amateur golfer. I have now written three profiles of Scottish golfers, Barclay Howard and Freddie Tait being the other two, and all of them have died well before their time. His failure to lift The Amateur Championship leaves him just short of the greats of the GB&I amateur game in my eyes but his record remains one of the best and as such he deserves to be recognised and remembered.